JOINT BASE ANDREWS, Md. — Defense leaders at a counter-Islamic State meeting expressed concerns about what happens after the expected defeat of the militant group, and whether countries are ready to help stabilize and rebuild the war-torn cities, particularly in Iraq, Defense Secretary Ash Carter said Wednesday. Carter also said that some nations have agreed to step up their contributions to the fight, as battles for the key cities of Mosul in Iraq and Raqqa in Syria loom. Defense and foreign leaders from more than 30 countries are in Washington for two days of meetings on the next steps to be taken in the fight to defeat the Islamic State group, which still maintains control of large sections of Iraq and Syria. Speaking to reporters after the first day's session wrapped up at Joint Base Andrews, Carter said a lot of the conversations were about identifying the needs for reconstruction after the battles are over. "The biggest strategic concern of this group of defense ministers was that the stabilization and governance effort will lag behind the military campaign," Carter said. "Making sure there's no such lag must be a significant strategic priority for us. We discussed it today and it will be an important focus of our conversation tomorrow at the State Department with our foreign ministry counterparts." Defense Secretary Ash Carter, top center, hosts the Global Coalition to Counter ISIL Meeting at Andrews Air Force Base, Md., July 20, 2016. British Defense Secretary Michael Fallon said more must be done to ensure that residents will be able and willing to return to the Iraqi cities. The coalition, said Fallon, must be sure it is "able to support the government of Iraq in the work that will be required the day after Mosul is eventually liberated." That includes efforts to get basic services turned back on and removing the threat of hidden bombs. He said "everything is booby-trapped," including the rubble, and the people won't have the confidence to return unless the explosives are cleared away. The gathering comes as Iraqi security forces, aided by the coalition, are preparing to encircle and eventually attempt to retake the key northern city of Mosul. The meeting of defense leaders lasted about two hours. 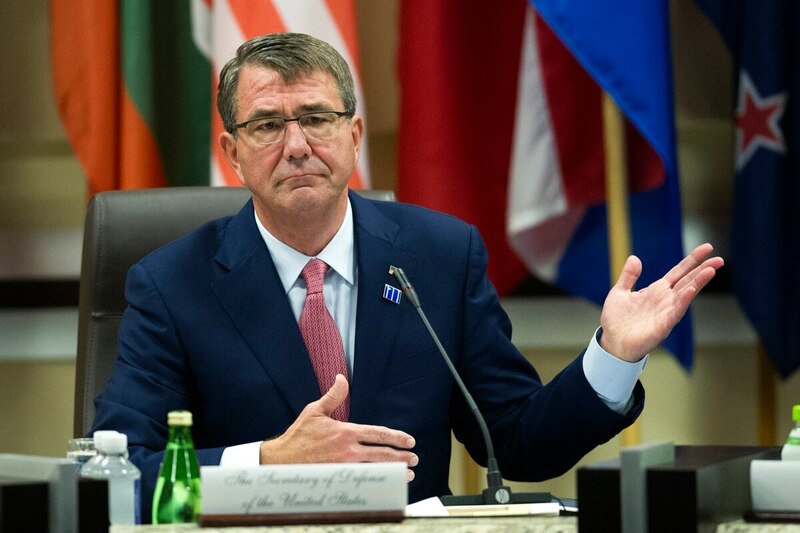 This is the fourth time that Carter has convened an anti-Islamic State coalition meeting. Secretary of State John Kerry was hosting a separate conference at the State Department Wednesday to try to raise at least $2 billion from donor nations to help Iraq as it takes territory from the Islamic State group. The money will go to humanitarian aid for displaced people, demining, immediate help to recently liberated communities and the people returning to them as well as medium-to long-term reconstruction and development assistance. The State Department said donors had pledged in excess of $2.1 billion, with the U.S. offering $310 million in new funds. "If we do not succeed in Iraq, none of our countries will be safer," Kerry said. "And likewise, Iraq is connected to Syria, and Daesh/ISIL is plotting against all of us and has already proven its capacity to attack one way or the other. So we are fighting back in every way that we can, and our assistance to Prime Minister Abadi's government and to our Iraqi friends is a significant part of the overall campaign to defeat Daesh." On Thursday, Kerry will host a joint meeting of defense and foreign ministers in the counter-IS coalition. 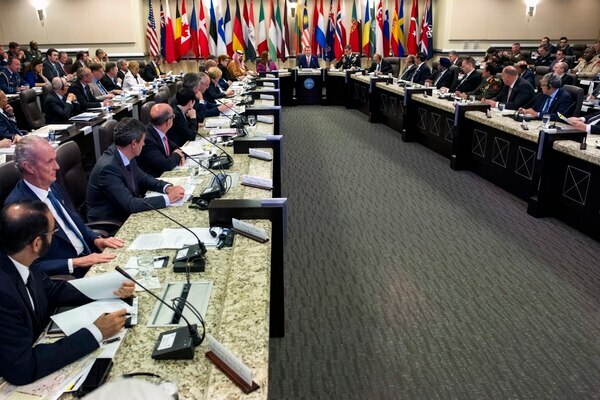 They are expected to talk about the coordination of political and military efforts, including counter-terrorist financing, combating the flow of foreign fighters, and the stabilization of cities and towns that have been freed from Islamic State control. "We are succeeding on the ground in Iraq and Syria but we have a lot of work to do," said Brett McGurk, the president's special representative to the counter-IS coalition. "This is an enormous challenge that will be with us for years to come." The gathering comes on the heels of the NATO summit in Warsaw earlier this month, when allies agreed to boost support for the anti-Islamic State mission, including the launch of a training and capacity-building mission for Iraqi armed forces in Iraq. The U.S. has announced that it will send 560 additional troops to Iraq to transform a newly retaken air base into a staging hub for the long-awaited battle to recapture Mosul from Islamic State militants. On Wednesday, Gen. Joseph Votel, commander of U.S. Central Command, told reporters that the U.S. hasn't sent "any large numbers" of the new troops into Iraq yet, but they will go "very, very shortly." He added that as the campaign moves forward the U.S. will continue to do what is needed — including add more troops — to meet the requirements of the fight. "We will, as we've done with our coalition partners, we will look to add additional capabilities that are necessary for us to accomplish our objectives," Votel said. The coalition is also looking to reinforce the fight in Syria, where U.S.-backed forces are in a tough fight for the town of Manbij. Manbij lies on a key supply line from Turkey to the Islamic State's de facto capital of Raqqa. Ousting the militants from Raqqa is a key goal for the coalition.